Finally at the historic town of Morgan the Murray begins to head south towards the Southern Ocean. As it continues to head south it passes through Blanchetown, Swan Reach, down to Mannum. The range of cliffs along this section of the Murray are truly spectacular. 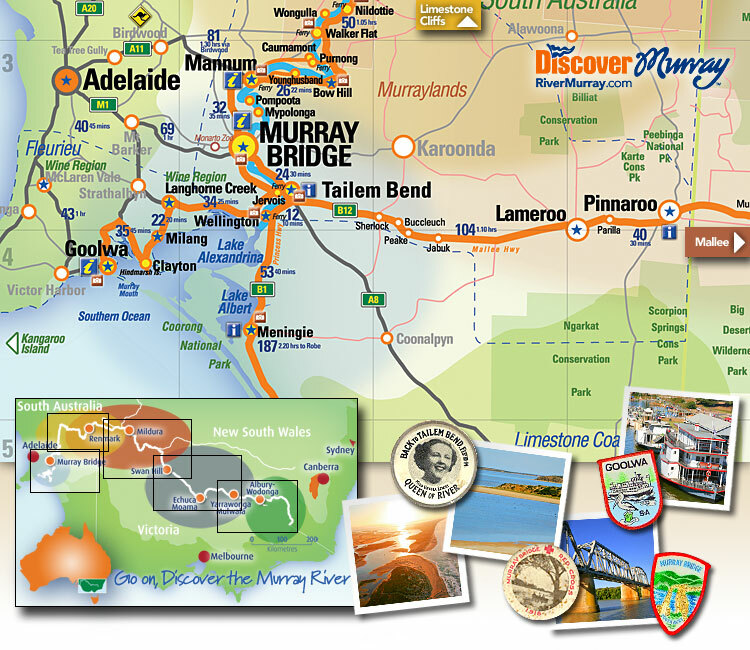 In the Murraylands, the Murray winds past a series of fabulous cliffs full of colours. Just near Nildottie, Ngaut Ngaut Conservation Park is a peephole into the past being preserved by present generations for the future. The cliffs are a showcase of fossils millions of years old through to graphic evidence of indigenous habitation going back thousands of years. A boardwalk takes visitors on a tour guided by local indigenous people, who interpret the evidence of the ancient campsites and the on-going culture. Permission is needed to enter the area. Finally the Murray begins it's journey towards Lake Alexandrina where you'll find the plains section from Mannum through Murray Bridge and Tailem Bend down to Wellington where it spills into the Lake Alexandrina. A wide and open lake system joined with Lake Albert, the smaller towns of Milang and Clayton enjoy the waters offerings. The last leg of the river's journey is at Goolwa right near the mouth of the Murray and near the barrage system. Go left from Wellington where the Murray flows to the sea and you have the Coorong, a long, skinny waterway cut off from the ocean by the sand dunes of the Younghusband Peninsula. This national park area is an internationally important bird habitat, with migratory birds visiting from as far as Siberia and China. It is a quiet, picturesque, evocative waterway made famous by the late Colin Thiele's book-turned-film Storm Boy.